VACCINATIONS are the only way to insure that Rabbits have optimum protection against these lethal diseases. Nobivac Myxo-RHD does NOT give protection against RHD2, for this to be achieved a separate vaccination is required. Most Vets are using Filavac. Some people may decide to shop around other Veterinary Surgeries to find the best price for vaccinations. This is of course entirely up to the individual, but personally I prefer continuity of care from a Vet who has full clinical information about my Rabbit's medical history and previous vaccination status. 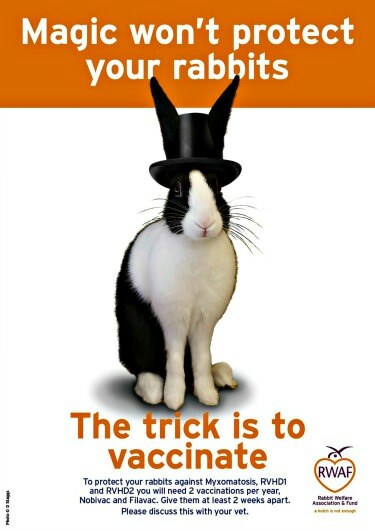 The most important thing it that your Rabbit(s) is/are vaccinated and that boosters are given at appropriate times. Last edited by Jack's-Jane; 30-01-2019 at 07:50 AM.